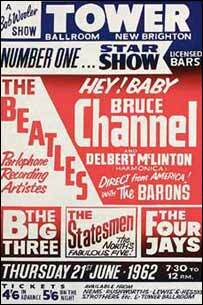 A rare 1962 concert poster advertising a Beatles concert has fetched £11,750 at an auction of pop memorabilia. Hundreds of items related to the Beatles, the Rolling Stones, Jimi Hendrix, Queen and Madonna also went under the hammer at the sale in London. A wooden sculpture of a cupboard, designed by John Lennon, claimed the highest price of the day, £28,200. Trousers worn in 1984 by the late Queen star Freddie Mercury were sold to the Hard Rock Cafe for £4,230. Thursday's sale at Christie's featured everything from lyrics, gold discs, unpublished photographs, contracts and concert flyers. An in-flight Pan Am menu signed by the Beatles fetched almost £10,000. The menu, from 1964, was one of 177 lots to be snapped up. Other items from the Beatles included an autograph note signed by Lennon for £19,975, and a signed programme for the group's 1965 US tour that fetched £13,512. A 1976 pencil sketch on paper of Charlie Chaplin by Michael Jackson went for £4,112, above its estimate of £1,200. Memorabilia linked to the greatest names in pop is highly attractive to collectors. Last month auctioneers reported a rare photograph of the Beatles on sale in an internet auction attracted huge interest from bidders. The 1965 picture, which lay undiscovered for more than 30 years, reached £6,900 in bids and the auction website attracted more than 30,000 visitors during its first few hours online. In April, a cardboard cut-out of Marlene Dietrich used on the cover of the Beatles' Sergeant Pepper album sold at auction for £86,250.